Yaya Toure has ended his self-enforced international break and will play for Ivory Coast in this month's Africa Cup of Nations qualifiers against Sudan. Manchester City midfielder Toure's last competitive international was the Nations Cup final in February 2015. Bournemouth midfielder Max Gradel, also absent since helping the Elephants win the trophy, is back after injury. Newcastle's Seydou Doumbia, Sunderland's Lamine Kone and Manchester City's Wilfried Bony are also included. China-based Gervinho is also in the strong 24-man squad, as is Hertha Berlin striker Salomon Kalou. But it is the return of their inspirational captain Toure, 32, that is the biggest boost for Ivory Coast as they continue the defence of the title. They sit second in group I on a single point, after being held to a goalless draw by Sierra Leone in Nigeria last September. The Elephants will host group leaders Sudan in Abidjan on 25 March before playing the return leg in Khartoum four days later. Coach Michel Dussuyer wants to take all six points in the back-to-back fixtures to avoid an embarrassing qualifying exit for the holders. 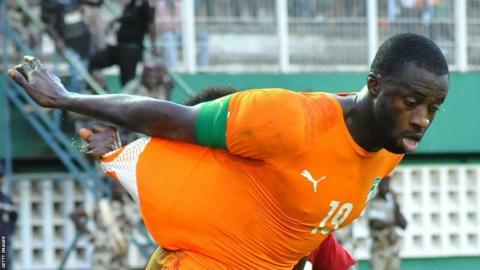 "That is our goal [six points] and we will work in this direction," he told the Ivorian Federation website. "But first we must earn the first three points in Abidjan before going to get a positive result in Khartoum. "For now, I want to focus on the first game where we plan to destabilise our opponent. The Sudanese will draw up a defensive screen in front of their goal. We will be working on our attack to find their weakness." The group also includes 2017 Nations Cup hosts Gabon but their matches will not count towards qualification. Only the group winners advance to the finals.